As the date for Nufoina Must Fall neared it was hard to anticipate what kind of experience it was going to be. From my research I knew the different components involved, but I had never experienced anything like Nufonia. In the end I can honestly say that Nufonia Must Fall is truly a story about love. One that demonstrates the power of emotions by presenting them in an unconventional way. Here are some of the most noteworthy points about the show and why it was so inspiring. The show began with an introduction from Kid Koala. He explained that Nufonia is derived from “no fun” and that what is going on in our heads can take away from the fun we could be having. Throughout the show I found myself so engrossed in what was unfolding that I never once stepped away from the story of Malorie and T4. Nufonia truly took on more than one meaning, allowing the audiences interaction with the play to remove them from thoughts of worry and stress. Just like Malorie and T4 as they were able to drown out the static of everything else when they were together. In addition, I was most impressed by the depth and range of emotion that was conveyed without words. The use of brilliant lighting design and thoughtful puppeteering, accompanied by a moving score, made you feel what was happening. As a result you could see Malorie’s smile, or feel T4’s rejection and fear. Consequently, I found myself lost in the emotions of the characters and engrossed in the cinematic beauty of the screen. Then blown away by the tiny set that was giving life to such powerful emotions. After the show the audience was invited on stage to see the sets and it was AMAZING to say the least! I was blown away by the realistic details and the amount of lights that could be squeezed into each tiny set. 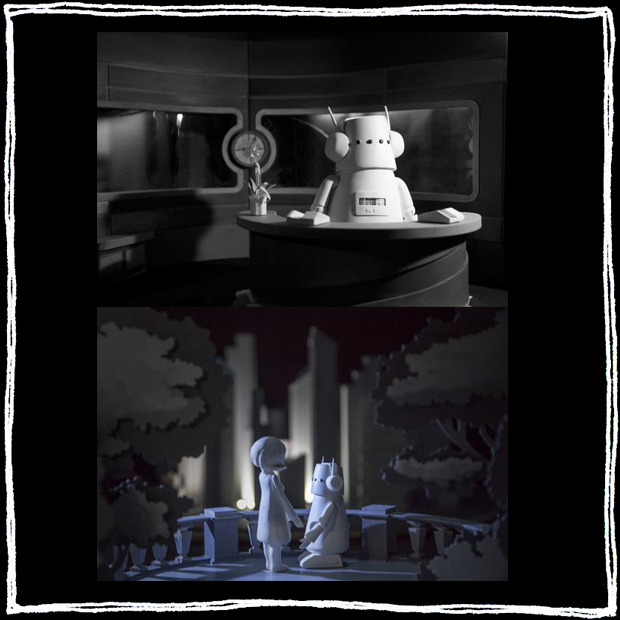 As an audience member you can see each component of the final product as it is projected onto the screen; the sets, the puppeteers, Kid Koala, the quartet and the filmographers. Separately, each aspect of the show is interesting. It’s easy to get lost in what they are doing, being able to see each part of the whole as it works to produce an entertaining and poignant show made me feel more of a connection to the characters. In conclusion I can honestly say that all of us left feeling inspired. What a wonderful night out! 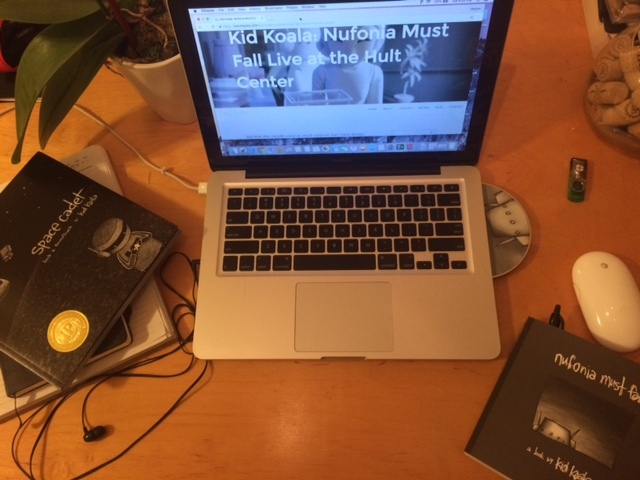 I scored my very own copy of Nufonia Must Fall & Space Cadet, Kid Koala’s second graphic novel! Each book includes a CD with a page guide so you can listen along as you follow the story. I definitely recommend Nufonia Must Fall and I hope it comes to a venue near you! Also, don’t forget to check out the Hult Center for the Performing Art’s list of current shows. And a big thank you to Hatchbytes Creative Agency for treating us to such an inspirational night! Because I can’t get enough of Nufonia Must Fall I have included this video for your viewing pleasure! !